In a large bowl, mix all of the ingredients together for the marinade. Add the tuna steaks and let sit for at least thirty minutes. Turn tuna steaks once or twice. While the tuna steak is marinating, mix all of the ingredients together for the daikon dressing in a small bowl. 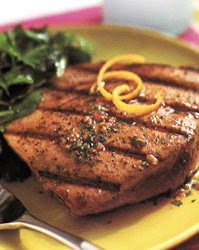 Remove the tuna steak from the marinade the pat dry with paper towels. Brush one side of the tuna with half of the oil. Transfer tuna steaks to a cutting board and slice. Arrange slices on serving plates. Spoon dressing over tuna slices and top of a few arugula leaves. Garnish with chopped chives.